Progesterone cream is sold over the counter and widely available. But is it really the best treatment for symptoms of hormone imbalance? And what should you look out for if you use it? Before you dive into what progesterone cream is and who benefits from added progesterone I’d like to help you understand what your natural progesterone is and what it does. Progesterone is a hormone made by the ovaries following ovulation. When you release an egg from the ovary there is a structure known as the corpus luteum left behind. It’s job is to secrete progesterone. If you’re a woman who is not ovulating then you will not have adequate progesterone and will experience symptoms of a progesterone deficiency. This is common in PCOS, post-birth control syndrome, hypothalamic amenorrhea, and can be the result of over exercise. As described in the medical literature, perimenopausal symptoms, like irregular cycles, hot flashes, mood swings, insomnia, vaginal dryness, typically begin about four years before a woman has her last period. This is also a common time to see a decline in cardiovascular health, including increased cholesterol. For some women, the decline in ovarian function can begin their mid-thirties or up to ten years before entering into menopause. And although your ovaries may be beginning their decline, it doesn't necessarily mean you'll have overt symptoms or be diagnosed with perimenopause. It's once the symptoms of perimenopause set in that we expect your ovulatory cycles to stop within the next five years. Thinking about starting progesterone cream? Read this first! Progesterone’s job is to stimulate the uterus to create an environment favorable for the implantation of a fertilized egg. Or in other words, it makes a nice home for baby to nestle in to. Now slow your roll if you’re thinking, “forget progesterone because I don’t want a baby.” I don’t care whether or not you’ve got baby making on the agenda or not. Either way, you need ovulate to make progesterone if you’re in your fertile years. When progesterone levels are optimal PMS is almost non-existent. We feel much more calm through our day, we sleep better, and estrogen doe not get the best of us. When progesterone is low we can experience symptoms of excess estrogen in what is called relative estrogen dominance. Your estrogen rocks, but when there isn’t ample progesterone to oppose it, well that’s when the cray sets in. We feel irritable, angry, swollen, bloated, and weight is sticking to those hips and thighs no matter what we try. On top of that, low progesterone can be at the root of anxiety, insomnia and breast tenderness. Like the kind of breast tenderness that makes you take the ramp instead of the stairs, avoid dancing and dread every movement that causes the slightest jiggle. Yeah, I've been there too. Give your body the nutrients it needs to create amazing hormones. Download your FREE Hormone Balancing Starter Kit with 7 Day Meal Plan & Recipe Guide Book. I’m a proponent of figuring out just why you aren’t making that progesterone to begin with before we consider leveraging a progesterone cream. But if you’re a woman over thirty-five, crazy stressed out, are in perimenopause or are postmenopausal then progesterone cream can be helpful to alleviate symptoms. 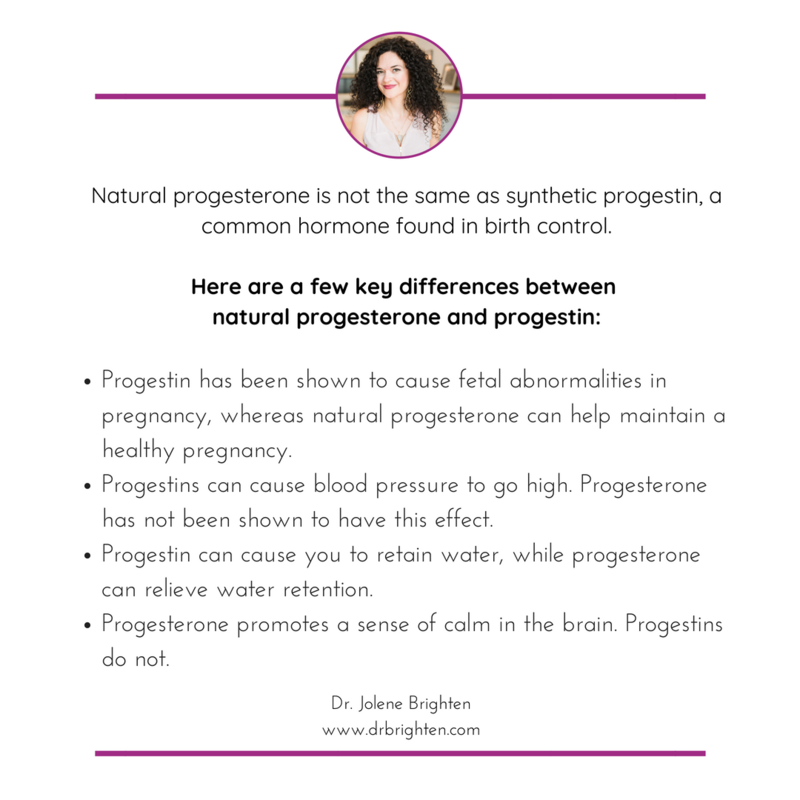 When it comes to progesterone there is some major confusion among women and in medicine about just what progesterone is and isn’t. Progesterone is a key hormone in helping ease anxiety, getting good sleep through the night, creating easier periods, and maintaining a healthy pregnancy. 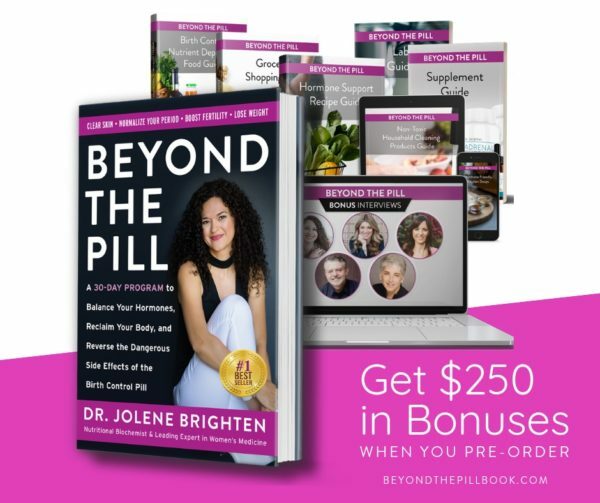 This audio snippet above is me reading from chapter 2 (The Lowdown on Your Hormones) from my new book, Beyond the Pill. Let me be crystal clear here, progestin, the synthetic stuff you find in hormonal birth control like the combination pill and IUDs is absolutely nothing like your natural progesterone. And I take issue with this misinformation being spread. You know how many times I come across a research study saying progesterone does harm only to find they were studying progestin? Or how about how the fact that the pharmacist hands out warnings about progestins when I prescribe bioidentical progesterone to my patient, which leaves them scared and confused? And believe me, the progestin outcomes are scary. It’s this kind of misinformation that confuses women and keeps them from getting the help they need. Progestin is altered in order to create a patent and may be synthesized from androgens (male hormones). On a biochemical level it looks nothing like the natural stuff you make. And progestin brings a whole lot of inconvenient and downright scary side effects like increased cancer risk, heart attack and mood disorders. Progestin has been shown to cause fetal abnormalities in pregnancy, whereas natural progesterone can help maintain a healthy pregnancy. Progesterone promotes a sense of calm in the brain. Progestins do not. Progestins can cause blood pressure to go high. Progesterone has not been shown to have this effect. Progestin can cause you to retain water, while progesterone can relieve water retention. There are several reasons to consider using progesterone therapy. If you think it might benefit you, I encourage you to speak with your doctor about your individual needs, risk factors and monitoring. Progesterone therapy is commonly used to maintain a pregnancy when the risk of miscarriage is high. This is not a DIY situation and I encourage all women to meet with their OB or midwife to discuss. Timing, dose, and duration are critical in pregnancy and progesterone isn't without its risk to baby as well. While too little progesterone can result in miscarriage, higher doses can cause fetal abnormalities. What's the best course of action? Talk to an experienced OB/Gyn or midwife to ensure you are getting the best individualized care. 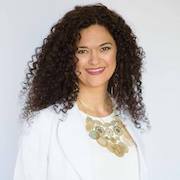 Anxiety, PMS, insomnia and other symptoms of low progesterone may be alleviated with using bioidentical progesterone, but let’s not forget these can have their own root cause that deserves thorough investigation. In women with PCOS, PBCS, and anovulatory cycles (no ovulation), progesterone may be beneficial. This is a definite “talk to your doc” situation because while you can support yourself in feeling better, you should also dig deeper to find the root of your symptoms. When used incorrectly progesterone can suppress ovulation and you could be doing more harm than good in these conditions. The ability to suppress ovulation does not mean bioidentical progesterone cream is an effective form of birth control. You'll understand why when we get into the “what you should know” of this article. If you’re a symptomatic woman who is perimenopausal, have entered into postmenopause or are using estrogen therapy and have a uterus then progesterone hormone therapy may be a good option for you to consider. When I meet with a woman in my medical practice I consider her symptoms and evaluate her on the individual level to understand if the benefits outweigh the risk before prescribing. There are several forms of bioidentical progesterone, with oral having the most benefit to anxiety and insomnia. Progesterone cream is one mechanism of delivery. Creating amazing hormones is possible! 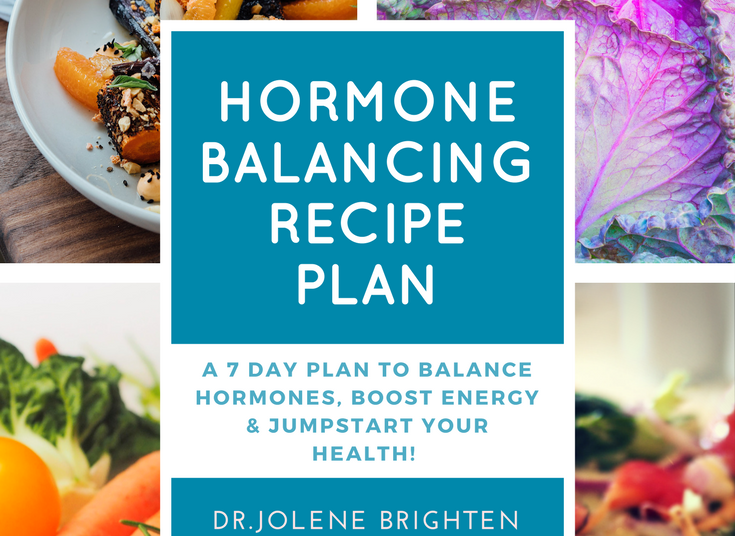 Download your FREE Hormone Balancing Starter Kit with 7 Day Meal Plan & Recipe Guide Book. So what do I recommend? If you need to supplement your progesterone production then bioidentical is a better choice. Clinically, I’ve seen women do better with bioidentical hormones compared to synthetic. Personally, as a woman, I have a lot more faith in a hormone that looks like and acts like my natural hormones then I do in anything a human synthesized in a lab to fake my body out. Why? Because your body knows better than a dude with a chem degree. Just say’n. Progesterone cream can be purchased at pharmacies, health food stores and even Amazon. But before you jump on the over-the-counter bandwagon, please talk with your doctor. Sadly, I’ve had several women come to my practice with abnormal uterine bleeding that had been using a progesterone cream recommended by an unlicensed provider (a health provider that does not have sufficient education to qualify for licensure or prescription rights) only to find they had endometrial cancer that was masked by the use of a hormone. Or women who come to me with new headaches, breast tenderness, mood change, fatigue, chronic yeast infections or other symptoms because they are being advised to use doses beyond what their body needs. This is no joke. Natural or not, you need a doc. And if anyone without a medical license that includes the right to prescribe recommends you use hormonal therapy, run away…fast. Or at least get your doctor looped in on the conversation. If you’re meeting with a practitioner that can’t prescribe a hormone then they shouldn’t advise on the use of that hormone. That’s not to say they are bad or trying to hurt you, it is only to say that they do not have sufficient expertise on the use of hormones in medical care. Just because they are natural doesn’t make them 100% safe. I’ve seen a lot of abuse of over-the-counter hormones at the urging of a well meaning health practitioner in my time that have done more harm than good, which is why I offer this word of caution. There are several kinds of progesterone cream available to women. Over-the-counter bioidentical progesterone cream, like Emerita, can be found at natural food stores and Amazon. This progesterone is synthesized from Wild Yam (Dioscorea spp), a natural plant source of progesterone. Progesterone creams are estimated to have anywhere from a 10-80% hormone absorption rate, which is a wide range. Couple that with the fact that many studies have called into question how accurate over-the-counter stated doses are and you may not be able to tell just how much hormone you’re getting. If you have impaired blood flow like we see in hypothyroidism or diabetes, you may not be getting the dose you think. If you apply the cream to a particularly hairy spot on the body then you may not be able to absorb the intended amount. With creams, you also have to be concerned with direct and indirect exposure to other people. Of course, directly touching someone after you apply the cream makes sense, but towels sheets and clothing can be another way you expose others to hormones. One significant benefit to progesterone cream is that you can change the dose with your current supply to increase or decrease your progesterone levels. While progesterone cream can alleviate many symptoms, it can also cause several symptoms that you should be aware of. Why Might My Progesterone Be Low? Before you head down the road of bringing on progesterone cream, pills or otherwise, I would encourage you to examine some common reasons your progesterone might be low. Working with a licensed healthcare provider can help you get to the root cause of your symptoms. Is Stress Robbing Your Progesterone? Look, we’ve all had bananas crazy stress with a “light at the end of the tunnel” scenario in our life and in the short term, progesterone can help. But don’t think for a second you can just use some progesterone cream and ignore that daily stress you’re not dealing with. When stress goes high your body gets the signal that the environment is dangerous and it does what it can to keep you safe—which often means stopping ovulation and bumping cortisol instead. And while yes, progesterone can give you symptom relief, it isn’t protecting you from the pro-aging, belly fat building, and brain hating effects of long term elevated cortisol. Plus, cortisol changes can block your progesterone from getting on the cell receptors, which means you won’t be very good at using it. Without thyroid hormone, you don’t synthesize other hormones, like pregnenolone which the body converts into progesterone. Hypothyroidism can be a reason why your periods go missing, get super irregular or you are diagnosed infertile. Testerone and all the metabolic issues that comes with PCOS can cause your body not to ovulate. Without ovulation there is no structure created in the ovary to support progesterone production. And while some progesterone cream might do well to suppress some of the symptoms, it does nothing to address the blood sugar imbalances that lead to diabetes and heart disease in PCOS women. Read more about PCOS here. Now don’t freak out! There are some significant diet, lifestyle and supplement support you can bring in to help you feel your best. A benign brain tumor could be behind your low progesterone. I wasn’t kidding when I said you should chat with a doctor. What is known as a prolactinoma is a benign brain tumor that secretes prolactin. This hormone goes high in lactating women, but in non-lactating women it can cause ovulation to stop, along with periods. And remember, without ovulation you won't have sufficient progesterone and symptoms can set in. A simple blood test is the starting place to understand if this is the cause of your low progesterone. Now look, if you’re ovaries are done and you’re over 45 then there may not be a way to get your natural progesterone production up to a level that makes you feel good. If you’re considering a progesterone cream then I’d recommend also employing these strategies along with a visit to your doctor. If you’re under 45 then I highly encourage you to start lifestyle therapies and investigate your symptoms before starting a progesterone cream. Remember, diet, supplement and lifestyle therapies can take 2-3 months to take effect. Be patient and monitor your symptoms as you introduce these. Stress works against you. Insert the eye roll 🙄because you know this. Walking, deep breathing, daily meditating, or ditching those toxic people in your life can go a long way in optimizing your hormones and bringing your progesterone back online. Cholesterol is necessary for the synthesis of progesterone. Studies suggest that improving insulin sensitivity can dramatically increase progesterone levels in those with luteal phase defects. Eating fat can help to balance blood sugar. Insulin sensitivity or blood sugar imbalance has deleterious effects on your hormones. Women wanting to improve their hormones should eat at least 1-2 tablespoons of fat at every meal to support natural hormone balance. When used over a three month period, Vitex can have benefits in raising progesterone. Vitex has also been shown to reduce prolactin secretion while raising progesterone levels. Aim for a minimum of 150 to 300 mg at night (magnesium is a relaxing mineral!) or eat plenty dark green vegetables, almonds, pecans, cashews, brazil nuts, seeds, legumes, brown rice, avocado, and dried apricots. If you’re experiencing significant symptoms of hormone imbalance, consider 300 mg magnesium nightly. 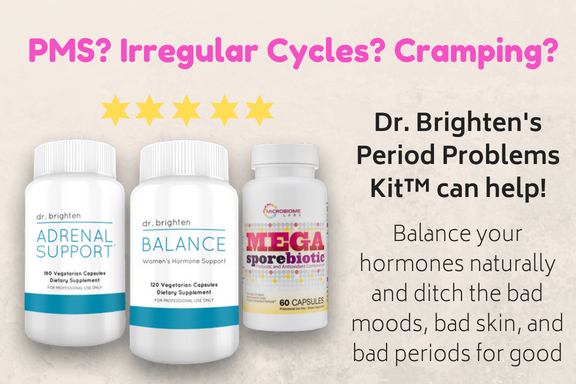 In my practice I recommend women take Magnesium Plus if they are experiencing symptoms of low progesterone because it is a highly absorbable form that doesn't create gastric upset. B6 is involved in estrogen metabolism and can easily become depleted if estrogen dominance is a problem. Vitamin B6 possesses “progesterone-like effects” and has been shown to reduce estrogen while increasing progesterone levels. 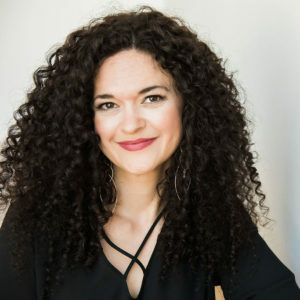 If you’re considering a progesterone cream I want to urge you to meet with an experienced practitioner first to understand if this is really the best option for you. It may be that you need to optimize other factors in your life before heading down the progesterone cream route. Now I want to hear from you! Share with me in the comments below. Have you tried progesterone cream? What was your experience? Have you used any of the diet, lifestyle or supplement therapies in this article? What did you experience? Do you have PMS, PCOS, PBCS, or are in menopause and have found progesterone therapy to be helpful? Share with me in the comments. Abraham GE. Primary dysmenorrhea. Clin Obstet Gynecol. 1978 Mar;21(1):139-45. Block E. Quantitative morphological investigations of the follicular system in women; variations at different ages. Acta Anat 1952; 14:108. Hirobe C, et al. Cytotoxic flavonoids from Vitex-agnus-castus. Phytochemistry, 46:521-24, 1997.
double-blind study. Arzneimittelforschung 43:752-56, 1993. O’Connor KA, Ferrell R, Brindle E, et al. Progesterone and ovulation across stages of the transition to menopause. Menopause (New York, NY). 2009;16(6):1178-1187. doi:10.1097/gme.0b013e3181aa192d. Ruiz AD, Daniels KR, Barner JC, Carson JJ, Frei CR. Effectiveness of Compounded Bioidentical Hormone Replacement Therapy: An Observational Cohort Study. BMC Women’s Health. 2011;11:27. doi:10.1186/1472-6874-11-27. Sliutz G, et al. Agnus-castus extracts inhibit prolactin secretion of rat pituitary cells. Horm Metab Res, 25:253-55, 1993.